Pack in all of the best things to do with limited time in Zion National Park. Zion National Park outside of Springdale, Utah is one of the most stunning landscapes you will ever lay eyes on. From the red rock peaks of the canyon, the oasis of the Virgin River flowing through Cottonwood Trees and other plant life in this remote desert landscape, and watching Desert Bighorn Sheep jumping from one cliff face to another. Zion National Park has it all. It also is a day hiker’s paradise. Angels Landing and The Narrows are two of America’s top trails and both hikes are located within the park and both are as diverse as the scenery around them. Desert Bighorn Sheep frequent the eastern side of the park. Look for them at pull outs near the Zion – Mt. Carmel Tunnel. The Narrows Hike is without doubt one of the most unique trails in the country. The trail is the Virgin River as it “Narrows” into a slot canyon within the first mile or so. So you only have 3 days? Don’t worry, you can have a “Never Forget” experience by following this itinerary. – Make sure to fill up your gas tank (Not many from this point on.) and stop at the Glen Canyon Dam Overlook. Lake Powell is another gem I will discuss at a later time. – Driving along Highway 89 you will see the beautiful Grand Staircase – Escalante National Monument. If you got a early start on your day, stop into the Big Water Visitor Center and check out the Dinosaur Museum. This area is a paleontologists dream. There is even a Triceratops Skull in the showroom. – After a couple hours of taking in the views of the Colorado Plateau, you will arrive at the East Entrance to the Park. Entrance fee is 35.00 per car unless you have a annual parks pass which is 80.00. The Mt. Carmel Highway is one of the best introductions to a National Park I have ever witnessed. You’ll see Checkerboard Mesa, Keyhole Canyon, and the treacherous Zion – Mt. Carmel Tunnel. (at 1.1 miles long and built in 1927 this National Historic Site is your portal to what people think of when they think Zion. – Enjoy the sights as you come down from the top of the canyon in endless switchbacks and pull over onto some of the car pullouts and take pictures of the rare California Condors flying overhead or arches carving into the rock above. – If you enjoy history or culture. Stop by the Zion Human History Museum. 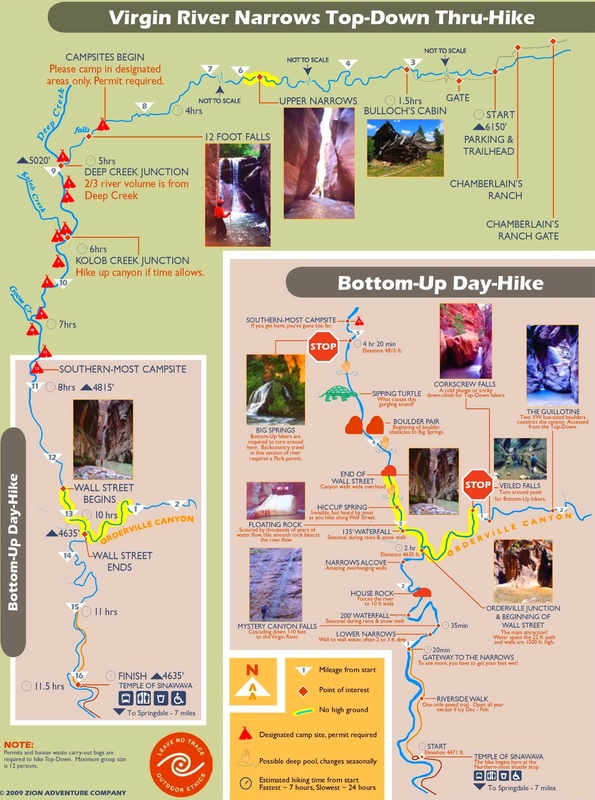 – Stop into the Zion National Park Visitor Center to get the latest trail information, water flow rates on the virgin river, and plan out the next two days. – It is time to check in to your accommodations for you trip. Front country camping (I will advise on Backcountry Permits in a future post) at the Watchman Campground or South Campground fill up quickly so it is best to reserve a site well in advance. If you want a true park lodge experience (again, plan to book well in advance) there is Zion Park Lodge. – Watch the Sunset from Canyon Junction Bridge. – Stop into Zion Outfitter to rent the needed gear for the Narrows hike tomorrow morning, then grab dinner in Springdale, Utah, then sleep. You will need it. – Side Note: Zion National Park has VERY limited parking. The free Zion Canyon Shuttle started on March 10, 2018 and will operate through the end of November. When the shuttle is running NO private vehicles are allowed on the Zion Canyon Scenic Drive. The only access is by free shuttle bus. Free shuttles will leave frequently from the Zion Canyon Visitor Center. There will be shuttle buses arriving at every stop every 7-10 minutes. There are also shuttles within Springdale, that stop at most of the hotel chains in town. See map of shuttle’s here. Day Two: Don’t be late!!! – Be at the Visitor Center Shuttle Stop no later that 6:00 am local time. The parking lots fill up like Walt Disney Word and you don’t have enough time to spend half the morning waiting on someone to leave the lot. Note: If you are at the Zion Lodge then add 15 minutes to the above time and be there. – Stay on the shuttle until the last stop “The Temple of Sinawava” This will begin your journey into the Narrows. Trailhead: Temple of Sinawava (the final stop of the Zion Shuttle on the Scenic Drive). Preferred Season: With proper gear, this hike can be enjoyed year-round. Seasonal snowmelt can close the hike during the Spring (the river must stay below 150 cfs for the hike to remain open). Elevation: Mostly flat but rocky and wet terrain. (Do not take this lightly. Flip Flops, tennis shoes, or any other related shoe will not work!) Please see link to the outffiters for renting the proper shoe for this hike. -After your journey, relax in the Zion Park Lodge and grab some food and drink. Hopefully you have a little bit of energy left and can make it through Hike #2. – Head back to your home away from home. Grab dinner and watch the sunset and stars. Day 3: Again. Don’t be late! – Get to the Zion Visitor Center at 6 am. Get in line for the shuttle. Note: If you are the Lodge, you can either take the Lodge Shuttle to the Grotto or hike the trail up to the Grotto which is a flat, easy trail of roughly .75 miles. Take Shuttle until the Grotto Shuttle Stop. Get off and fill up all the water you can at the filling station next to the shuttle stop que line. The best time of year to hike Angels Landing is in spring, summer and fall. During winter the trail ices over and can be extremely dangerous. Do not hike during a thunderstorm. Drinking water and restrooms are available at the Grotto. Carry water and snacks. Use a small backpack so your hands are free to hold the chains. Yes, CHAINS! The trailhead is at the bridge across the road of the Grotto Picnic Area, in Zion Canyon. The first part of the hike follows the West Rim Trail, which is clearly identified by a sign. The trail is broad and well maintained. The first section is fairly level as it follows the river and then crosses the canyon bottom. Switchbacks allow the trail to climb the canyon wall, up to Refrigerator Canyon. That canyon is pleasantly cool, scenic, and walking is easy. The trail then climbs another series of switchbacks, called Walter’s Wiggles. These 21 switchbacks are very tight and you gain elevation rapidly, but this section is short and not oppressive. The Wiggles put you on top of the ridge, at Scout Lookout, where views are amazing. Restrooms are available here, but no drinking water. From Scout Lookout, gaze at the ridge to the south and you’ll get a good idea of the difficulty of the rest of the hike. For the final 1/2 mile, the trail follows the ridge across a saddle and up the hogs back. This is where things get interesting, steep, where you are grateful for the chains. -Once back down from one of the best view’s in the world, grab a quick bite to eat, gas up the car and head back home. Refreshed and energized by an epic experience in Zion National Park. Hanging Gardens of Ferns and Wild Flowers are Plenty. Make sure your camera is ready to go…and waterproof.